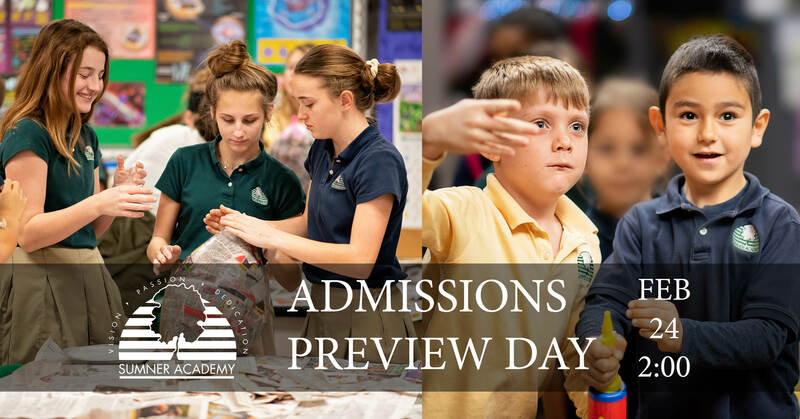 You are invited to attend our Admissions Preview Day on Sunday, February 24th at 2:00 p.m. in the William E. Hovenden Student Center on campus. Parents will have the opportunity to take a tour of the school with knowledgable faculty members. How old does my child have to be to attend your Pre-Kindergarten/Kindergarten? Your child must be 4 before July 15, 2019 to attend our Pre-K, and 5 before July 15, 2019 to attend our Kindergarten. Additionally, students must complete an admissions screening before being considered for acceptance for the 2019-2020 school year. Is Sumner Academy a good fit for my child? Sumner Academy is proud to have students with a wide variety of interests, gifts, and talents. Students who will benefit from an accelerated academic environment and who display good character qualities often find Sumner Academy to be the ideal school. Parents who expect to be involved in their children's education and who want their children exposed to a variety of curriculum components (robotics, Shakespeare plays, Ukulele Club, and adventure education to name a few such components) tend to be happiest at Sumner Academy. Can my children come to Admissions Preview Day? Yes! As a school serving families with children ages four to fourteen, we are very child friendly! No need to arrange child care. Will I get One-On-One Time? Admissions Preview Day is meant to serve multiple families in a low-pressure, group tour environment. While we are happy to answer general questions, if you require further assistance, feel free to schedule a tour with our Director of Admissions at another date. The month of February is the perfect time to schedule your spring Admissions appointments in time for the 2019-2020 school year.